It is clear to me that women face unique problems in the workplace that their male counterparts do not have. One of these problems is known as the gender wage gap. Most estimates show women only earning about 85% of the salary of their male counterparts. Different studies come to different conclusions as to why this is occurring. Today I went to the USTA US Open’s opening day. Looking through the program, I recognized that both winners receive the same prize money of $3.8 million. This should not be shocking given it is 2018, however, in other parts of the economy/society this is certainly not true. That said, later in the day, something caught my eye that bothered me. 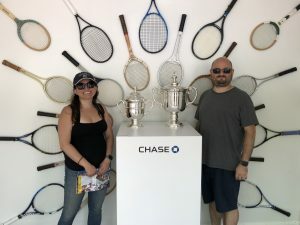 While at the championship, I took a picture standing next to the USTA US Open Singles Champion cups. I say “cups” plural because there is a large sterling silver cup for the Men’s Singles Champion and a second identical sterling silver cup for the Women’s Singles Champion. Indeed, the cups are beautiful and valuable. There is only one problem: as you can see in the photo the cups are not actually identical. The men’s trophy is about 1/3 larger… than the women’s trophy. The difference in the size of the cups bothered me enough to write this blog. I did take a short 10 minute online look but was unable to find reliable information or specifications regarding the history or design of the cups. I ask the both the USTA and the CUNY Commons community….. is there an inherent or symbolic inequality in having the Men’s Singles Cup larger than the Women’s Singles Cup? Please comment below and thank you for reading.